FIRST EVER GOLD FOR BRITAIN IN UNLIMITED AEROBATICS. Gerald won the European Freestyle Aerobatic Championship in Slovakia beating 21 of the best European aerobatic pilots. 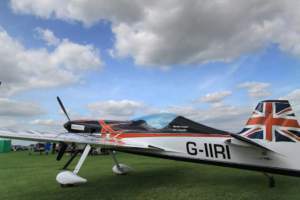 Competing in the new XtremeAir XA41 high performance monoplane, Gerald became the first ever Brit to receive a gold medal in Unlimited aerobatics in the history of aerobatic sport flying. Gerald Cooper Aerobatic Pilot: Dynamic display flying to wow the crowds! 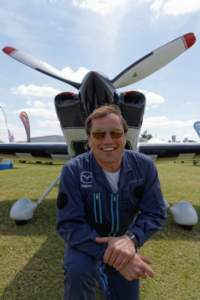 Gerald Cooper is a much-admired air display and competition pilot whose mission is to raise the profile of sport aerobatics. With an array of international medals and national championship titles to his name, Gerald continues to wow the crowds with his imaginative freestyle routine choreographed to demonstrate the art of precision flying necessary to succeed at the top end of Unlimited competition aerobatics. Gerald’s awe-inspiring freestyle routine demonstrates the impressive capabilities of his new carbon fibre aircraft – the Xtreme Air XA41 – with its superb power to weight ratio. By performing a combination of high-speed, animated gyroscopic figures, Gerald demonstrates why he is currently ranked as seventh in the world for competition aerobatics. Gerald Cooper’s display flying recently impressed the judges at the Royal Naval Air Squadron Yeovilton Air Show 2012 to present him with the award for Best Fixed Wing Display. This accolade is testament to Gerald’s unique aerobatic aptitude impressing the judges over arguably some of the best air display pilots in the world, such as the RAF Red Arrows and the Saudi Hawks. Fitted with a 315hp Lycoming engine, flat out the XA41 is capable of over 220mph and has a roll rate of 450 degrees per second, which is one and a half times around per second. It has a climb rate of 3,500ft per nm. It is light on the controls, weighs just 500 kilos and is comparable to a supercar. 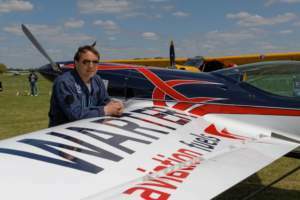 Note: Gerald Cooper is sponsored by new AvGas brand WARTER aviation for 2013. Gerald is UK Partner and Ambassador for the brand. WARTER aviation branding features on the wings of the aircraft and the corporate colours are red and white. Gerald’s display is a freestyle routine lasting approximately 7 minutes from take-off to landing. The style of the display is gyroscopic aerobatics focusing on performance and precision. If commentary is unavailable please consider high energy music. 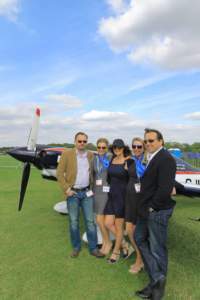 Sywell Aero Expo saw the launch of this new brand of aviation gasoline to the UK general aviation market introduced by UK partner and ambassador for the brand Gerald Cooper. WARTER aviation provides the highest quality AvGas delivered in bulk and drums throughout the UK from its own refinery in Poland, established over 45 years ago. A simple supply chain with no third parties, environmentally friendly production processes and eco transport solutions mean that the brand is able to offer affordability, reliability and efficiency direct to aviation operators in order to reduce their cost base. WARTER aviation UK aims to set a new benchmark for purchase and supply of AvGas, changing the way the general aviation community thinks about fuel in the UK. “In building WARTER aviation UK we are confident that not only is our product the best performing, but we also have the capability to fulfil our customers’ needs through our high quality product, competitive pricing and reliability of supply,” Gerald commented. Gerald has held the British National Aerobatic Champion title since 2009 and is repeatedly ranked in the top ten at World Championships. In 2012 Gerald became the first Brit to ever win Gold for freestyle aerobatics at the European Aerobatic Championships in Slovakia. Gerald’s aerobatic abilities stem from his in-depth engineering knowledge and over 8,000 hours’ piloting experience achieved over the last 20 years. With a flying style that is both aggressive and highly accurate his aerobatic displays are always distinctive, innovative and hugely popular with his public audiences. Over the past two years, Gerald has been pushing his purpose built Xtreme Air aircraft to its limits before crowds of hundreds of thousands, broadcast worldwide. This year will again see him attending many air sports competitions, air shows and private events across the globe. Gerald attracts extensive exposure and publicity and feels a great responsibility to present a strong image for British aviation. Gerald also participates in TV documentaries worldwide and is a regular on the Sky Sports channel as well as frequently being featured in sports flying and commercial flying magazines. In his spare time Gerald provides training and coaching for the British Advanced Aerobatic Team as well as many individual pilots looking to progress in aerobatics.